Inance Toner is Step 2 in the Inance Skincare Six Step Program.It is an essential lotion you can use after cleansing your face with one of our step 1 products. Our alcohol-free toner soothes your skin using Aloe Vera and botanical extracts. It is formulated to restore your skin's normal pH balance and leaves a smoother and more refreshed feeling. Directions: Use twice per day after using an cleansing with Inance Cleanser of your choice. Use a cotton to apply and do not rinse off. Step 1- Cleansing: Choose from Inance Cleansing Cream or choose Inance Gel Cleanser for your skin type. Step 2- Toning: Use Inance Toner to properly restore your proper pH balance of your skin. Step 3- Correct and Repair: Choose 1 of the following 2 choices for your Daily 6 Step Program. 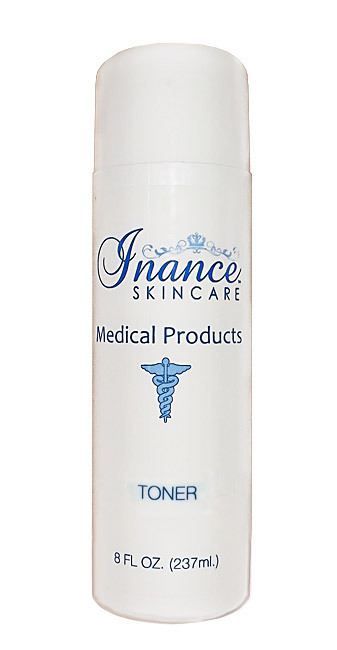 Inance Skin Lightener- Use to correct unwanted pigmentation such as age spots, liver spots, freckles and other unwanted areas of excess melanin or hyper pigmentation. Inance Skin Enhancer: Is formulated with natural ingredients. Contains alpha-Arbutin and Kojic Acid. Both ingredients are very effective to produce an even balanced skin tone. Step 4- Exfoliate: Choose one of our Inance Exfoliators. Inance Exfoliating Lotion is for normal to dry skin. It improves your skins texture and helps you maintain smooth and clear skin. Inance Exfoliating Forte is a good choice if you have thicker or over oily skin. Works well on Acne. Step 5- Balancing: Inance Balancer regulates melanin production, Gives your skin an even tone and Lightens freckles, age spots and hyperpigmentation. Inance Sunscreen HQ SPF 15 is PABA free and protects against both UVA and UVB rays. It contains sunscreens to help prevent recurrence of skin darkening. This product is not intended for use to prevent sunburn. It is indicated for the treatment of unwanted areas of melanin hyper pigmentation. Please choose a sunscreen below for daily care.